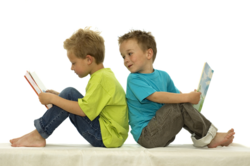 Home >> Prof. Development >> Cathy Puett Miller on Literacy: Who's On Your Reading Team? Matching instruction to the needs and interests of every student is an overwhelming challenge. In this setting, no teacher should be without the simple strategy of read alouds. Whether teaching elementary, middle, or high school, read alouds connect students to the content they need to learn, peak student interest, and provide information. Who, after all, doesn't love a story? Sylvia Galliard, media specialist at Carmel Elementary School in Woodstock Georgia, is the best when it comes to read alouds. With dramatics and enthusiasm, she uses read alouds to maximize interest at any age. "A read aloud experience should be one that astounds them, shares an amazing story, or provides incredible information," explains Galliard, who uses books like The Chinese Mirror, by Mirra Ginsburg to familiarize her metro-Atlanta students with a far away culture. "For younger children, this book serves as their first introduction to Asia. For older kids, it leads to a study of oriental cultures or folktales." * Pick read alouds to match specific curriculum objectives. Ask: Does the read aloud introduce a new concept? Reinforce learning? Expand understanding? Explore a local bookstore or library's picture book collection for possibilities. * Rehearse. Ask: Does the story have "kick?" Is the language rhythmic? How can voice inflection, pauses, and expression make the book come alive? Reward students by letting them present a read aloud (a great application for reader's theater). * Prompt students with a purpose: What should they know when you finish? Tell students why you chose the story (to introduce a unit on dinosaurs or weather, share information about the Middle East), or let students predict. The latter helps students recognize their own connections and extensions. * Use read alouds to spark independent learning. "If you liked this book, try" Share reading lists from textbooks, associated teachers' guides, or your media center. Galliard also knows how to use read alouds to engage hard-to-reach kids. "Anytime I give a child a different view of what he or she can learn, I'm on target." She chooses nonfiction books like Koko's Kitten, by Dr. Francine Patterson, when science curriculum examines primates. The Book of Rhythms, by Langston Hughes, introduces musical concepts to students at many levels. It also can introduce a study of jazz and twentieth century literature -- as can Coming Home: from the Life of Langston Hughes, by Floyd Cooper. As more school districts, including her own, implement curriculum mapping to coordinate efforts across various subject areas, Galliard sees read alouds as a natural part of the process. "At a glance, I see what each grade level is teaching. Then I use read alouds to augment what is being taught in students' classrooms and our classes have more impact." Janet Hollis, a new friend of mine who teaches at Grissom in Huntsville, Alabama, believes read alouds also have a place in high school. Hollis, a reading specialist and 26-year classroom veteran, explains, "I have a specific purpose in mind with each read aloud. I often use simple picture books to illustrate literary concepts like point of view (The True Story of the Three Little Pigs, by Jon Scieszka) or setting (The Faithful Friend, by Robert D. San Souci). With students who have limited reading skills, I use read alouds to address the gap between their listening and reading vocabularies." Hollis expands her approach by also using read alouds for cultural literacy, or to help students understand writings from the 19th century and earlier, such as Charles Dickens' Great Expectations, Homer's Odyssey, or the plays of Shakespeare. "Hearing how punctuation, rhythm, or fluency in reading work in those texts helps students comprehend them." Hollis adds, "On the other hand, I occasionally share a read aloud that's nothing but fun." Want one more reason to use read alouds with students? The activity involves no extra worksheets or grading papers. It builds on the curriculum without more busy work. At the same time, it enriches vocabulary, builds background knowledge, and enhances listening skills. Most of all it, gives teachers a means to expand and reinforce student learning. What a power pack! Pick up your first book today! The Greedy Triangle, by Marilyn Burns. Can be used to introduce geometry and shapes. The Shortest Day: Celebrating the Winter Solstice, by Wendy Pfeffer. This book covers the science of the solstice, and as introduces modern solstice celebrations. The scientific experiments included at the end of the book are a plus for teachers. Painting the Wind, by Patricia and Emily MacLachlan. Hidden in the story of a boy who spends his summer on a New England barrier island are introductions to categories of painting (landscapes, still life, portraits) and a mention of the choices artists make in selecting material, setting, and so on. Use this book as a springboard for looking at famous works of art and categorizing them according to a variety of different criteria. My Mama Had a Dancing Heart, by Libba Moore Gray. Make multiple connections with this beautiful introduction to family relationships, Mother's Day, loss of a parent, seasons. Open a discussion on dancing using compare and contrast. The Great Migration: An American Story, by Jacob Lawrence. Written for high-school students, this picture book, illustrated by one of the greatest 20th century African-American artists, describes the migration of African Americans to the north after WWII. A Picture Book A Day: Connecting Reading to the Arts, a 180-book reading list by Cathy Puett Miller, AKA The Literacy Ambassador. (Send inquiries re: orders to [email protected]). The Elementary Science Integration Project promotes read alouds as connections between language arts instruction and inquiry-based science in grades K-8. Integrating Reading Skills and Social Studies. An online article from the Children's Book Council on using literature with middle school learners.